Local weekly Stafford County Sun will also join the roster. 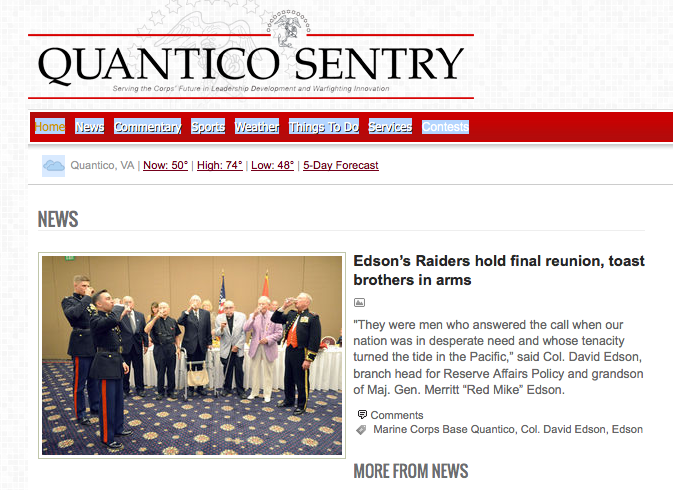 Northern Virginia Media Services, publisher of NoVa weeklies and the website InsideNoVa.com, among other properties, has been contracted by the Department of Defense to serve as the publisher for two military papers, the Belvoir Eagle and the Quantico Sentry. The former is targeted to personnel living or working on the Fort Belvoir Army installation, and the latter serves those on the Marine Corps base in Quantico. The company will handle distribution and advertising for the papers, while content will be left to each base’s public affairs staff. The company is also adding the Stafford County Sun to its previous roster of five weeklies spread across NoVa counties. In 2012, Northern Virginia Media Services acquired the popular InsideNoVa.com, rescuing the site after Warren Buffett’s World Media Enterprises announced plans to close down the site.